After a very rough family time to start the year ​we are happy to announce we are back in action. Thanks to everyone who sent condolences and prayers during this difficult time. Look for new and updated cases to be coming soon. We are stopping all investigations for the holidays but are available to anyone with questions until the new year. Here is the link to the article from The Fulcrum that our founder was interviewed for. Click here Also we have had to cancel our trip to buck hill due to weather conditions but we do have some really big news coming soon. Follow our blog for the latest news as it happens. Rose City Paracon was a success thanks to all those who came out to see us and take it in. Now it's back to what we do best. Lots of new cases coming so check our new blog for more. Also look for the interview with our Founder John Moore in the Fulcrum Newspaper at the university of Ottawa this October. With the fall coming lots of new things including our new blog for live updates of cases and events as they happen. 2 new cases coming in the next few weeks along with our trip to investigate the paranormal activity at a location known as Buck Hill, ON. Check back often for more updates and follow along. Arrived in St. Andrews NB and were given a private tour by the ghost walks of St. Andrews. Some really interesting locations. We're looking forward to returning and spending some time investigating some of them next spring. We're getting ready for our annual trip to New Brunswick if you or someone you know there is in need of our services please contact us and we'll make arrangements to speak to them while we are there. Happy Canada Day to everyone and don't forget on July 16 we celebrate our second year in operation. Lot's of big things coming up so check back often and follow us on facebook for the latest breaking news on events and investigations. Public reveal for Case file 15-0010113 completed click the link to see what we caught. Our summer of investigating is under way we have a lot of cases coming so look for reveals to be posted soon from a number of cases. Our Forum was down recently due to some maintenance on the host server but it is back up now please feel free to browse the content there including our case files. Public reveal for case 14-0040425 is complete. Public reveal for case 14-0040425 coming soon lots of good evidence from this one. Our founder John Moore has been asked to speak at the Rose City Paracon taking place in Windsor, Ontario September 26, 2015. Bishop Angelikas as well as members of Haunted North America Network will also be there so we hope to see as many supporters there as possible. We will be hosting a Ghost Hunting 101 course with our friends at Witch Hollow. For more info or to sign up please Click Here and you'll be redirected to our facebook event page. Public reveal of case 14-0030415 complete visit our case files page to see what we caught. Client reveals for cases 14-0030415 and 14-0070908 scheduled for Dec. 6 public reveal soon after. Case File 14-0081117 "the witches hollow" updated and scheduled This could be our best case yet. Our founder John will be appearing on Delaware Paranormal Princess radio on Nov. 24 2014. Hope everyone can tune in for the show. www.paranormalking.com/entertainment.html is the link for that night or visit our facebook page for more info. New case coming soon this one will be our biggest yet. More info to come soon. Welcome to our new investigator Helene Arts Watch for her bio on our team page soon. We have released a new Shirt for the public visit our apparel shop to purchase one today. More items will be coming later. Case file 14-0030415 is now in review stage look for updates coming soon on this and other cases pending client reveal. Case 14-0060807 has been confirmed for investigation to take place September 20, 2014. Client reveal for case 14-0010202 has been scheduled for August 27 . Check back to see what we captured on August 28 for our public reveal. Case file 14-0030415 Investigation has been rescheduled for August 15, 2014. Today is our anniversary of the first full year of operation. Check out our year in review video on youtube. Click here. Case 14-0060618 has been postponed and will be revisited next trip to the east coast. The case file will be renamed at that time. Case 14-0050610 the client has asked for complete anonymity so we will not be releasing any information regarding this case. Case 14-0050610 Investigation goes tonight. Case 14-0060618 goes tomorrow. Case backgrounds for both will be posted once permission is obtained from the clients. Arrived in New Brunswick yesterday preparing to investigate case 14-0040425 tonight with the Wolastokwik Paranormal group case claims are up now click here or visit our case files page and click on the case number to see what's in store for tonight. Case info for 14-0050610 and 14-0060618 should be received tonight so look for updates for them tomorrow. Review for case 14-0010202 underway looking promising. Getting ready for our east coast trip for three new cases in New Brunswick details will be released as soon as we get clients permission to disclose. Investigation for case file 14-0010202 taking place. Location undisclosed as per clients request. Client permission granted for case 14-0010202 however location is to remain confidential. Met client for case file 14-0010202 waiting on client permission to release any case information. Our founder John joined the crew from www.letstalkghosts.com visit their web site to hear the interview. Case 14-0030415 postponed at clients request. Will reschedule for a later date. Client reveal for case file 14-0020308 done no evidence captured unfortunately. Client reveal for cases 13-0021020 completed Technical issues preventing public reveal we hope to have the issue solved soon. Case file 14-0020308 investigation completed waiting on review. Congratulations to our founder John Moore on being named The Director of Demonic Investigations for Haunted North America. 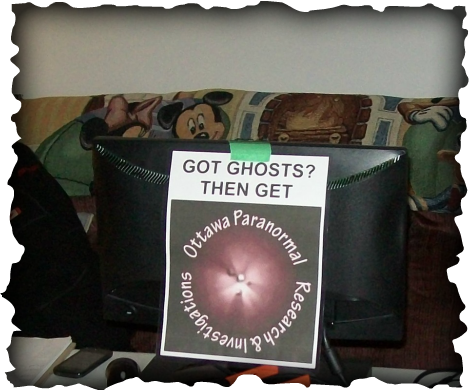 Also, our listing is now live at The online paranormal societies directory. Reveal for Case file #13-0021020 postponed due to weather and family obligations to be rescheduled soon. Reveal to client for Case file #13-0021020 scheduled for March 22. Met client for Case File #14-0020308 Investigation confirmed for March 29th. May also have another case added by our Cornwall liason. 2 more cases added 14-0020308 pre-investigation interview confirmed. Investigation for case 13-0021020 completed. Investigation for case file 13-0021020 postponed till February 21 2014 at clients request. Confirmed with client and team investigation for case # 13-0021020 for February 8th Case file 13-0011102 officially closed. Happy New Year from all of us at OPRI. All the best for 2014. Have a safe and Merry Christmas from all the staff and families Here at OPRI. Hope your holidays are joyous and safe. Public reveal of evidence. Visit our Case files page to view case file 13-0011102. Evidence reveal with client completed. Case file 13-0011102. Reveal with client this coming week. Look for evidence to be posted after the reveal. Evidence review for case file 13-0011102 is now completed.